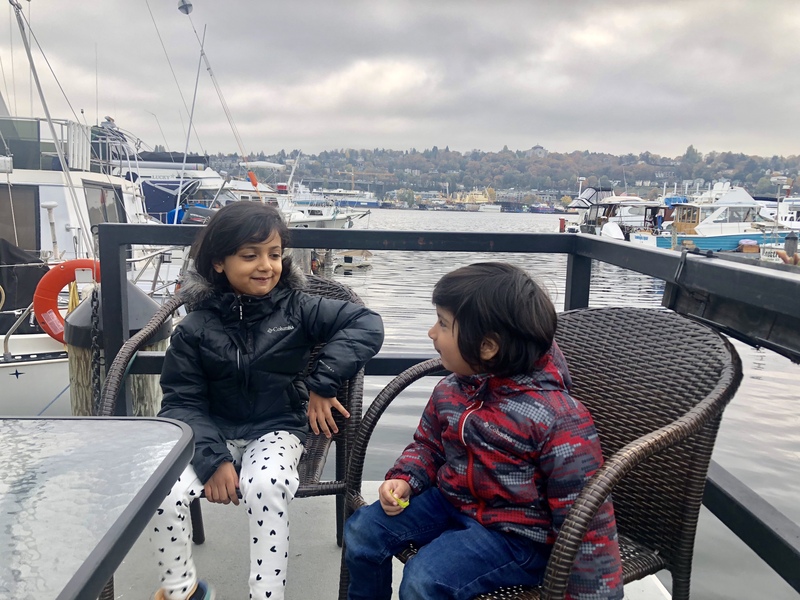 We were in Seattle this fall and really enjoyed staying on a houseboat with kids on Lake Union. Sharing our experience and all the questions you all had about staying on a houseboat as a family. I had wanted to stay on a houseboat for a long time and got the perfect opportunity when we visited Seattle this October. As I shared my experience via Instagram stories many of you asked how it was staying with kids and expressed safety concerns etc. Answering all your questions here. You can actually book a houseboat on Air BnB! You can also google “houseboats for rent” for the city you’re looking for and will find many options. We chose Air BnB since we didn’t want a long term stay. Most houseboats description will mention if the boat is suitable for children. However, be extremely careful when staying on a houseboat with kids. We never let our children outside without one of us being with them all the time. There are ropes and fences on a houseboat but children have to be reminded not to run around. We stayed on Lake Union in Seattle and the kids loved watching the seaplanes take off and land. There was much for them to observe from the patio of the houseboat. Once we were inside the houseboat after it was dark and cold, the kids enjoyed the board games and puzzles I had taken along. We did have wifi on our houseboat but it was quite spotty. If you plan to take tablets for your children, make sure the shows are already downloaded. Houseboats have limited supply of energy. So best to leave the hair straightner at home. Most houseboats stay moored and aren’t moving. However you will feel a gentle rocking as is excepted when you’re on water. Our houseboat had a little kitchen with a stove, oven, refrigerator etc. Houseboats are moored close to each other so be quiet once darkness falls, since noise really travels. I do want to conclude by saying that it was a wonderful experience of staying on a houseboat with kids. Whether you are a Sleepless in Seattle fan or just generally curious, this is an experience you must definitely indulge in. It made us more conscious of space and amenities that we enjoy in our houses and we felt closer to nature. The best part had to be the views. Just look at our night time view from the houseboat! Hope you enjoyed this post! Let me know if you have any questions! Next Post Book Recommendations: An Inspirational List of Great Books To Read! This looks like so much fun!! I never even knew you could rent these. I’ve seen them in Victoria, B.C and always thought they looked so charming. Can you do a post on how you do long drives with kids? I want to drive down to Seattle but am hesitant with my two kids.